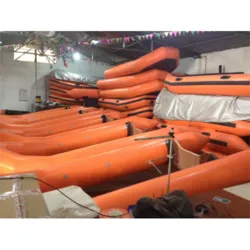 Established in year 2002, “Ganesh Manufacturing” is among the fastest growing companies involved in the production and supply of top quality boats, life jackets, industrial gas balloon, flexible tank and flexible pond. Our collection is manufactured from the quality approved raw materials as per the set quality standards. The durability, portability and flexibility of our innovative assortment have been widely appreciated by our valued clients. 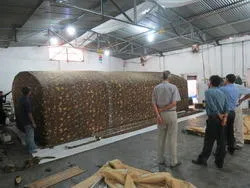 We have with us a proficient team of professionals, high-tech infrastructure and capacious warehouse enabling us to work on our principles of “Handling Client's Consignment with Utmost Care”. We also have with us light and heavy vehicles for swift and easy movement of our products. We also maintain a database of collection, reception and distribution of goods for future references. Our emphasis on quality and planned manufacturing process, enable us to acquire the complete clients satisfaction. Our all business operations have been successfully carried out under the direction of our mentor Mr. Trilochan Raut. His rich experience and visionary business has assisted us to garner a large clientele across the worldwide. We have earned accolades by offering the best quality range with customized solution. 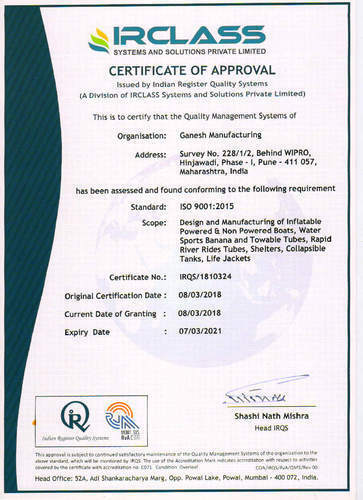 The company has the ISO 9001:2015 Quality management system certified by Indian Register Quality Systems (IRQS) & registered under NSIC. All our inflatables are manufactured using Hypalon coated fabric known for its best UV & abrasion resistance. Use of quality raw material: Hypalon & Polychloroprene coated fabric, valves, and adhesive. We lay special importance to the quality of our assortment. The products produced by us are stringently tested to ensure rigid construction, portability, and compatibility. Our range is customized as per the exact demands of our clients. 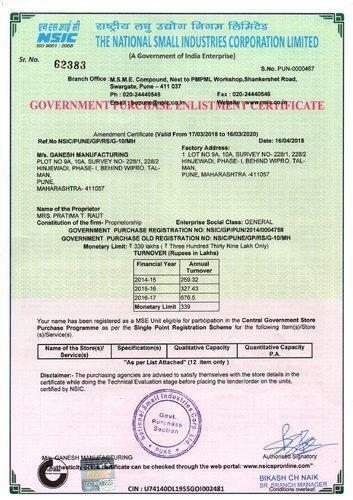 We are registered under NSIC for supply of optimum quality products. In order to meet the quality expectations of our clients, we have employed a highly dedicated team of professionals. Our personnel devote their sufficient time to understand the needs of our clients and manufacture an innovative collection of products. Our professionals work cooperatively to carry out all fabrication activities efficiently. Team of experts keeps an eye on each and every process of development and ensures supreme quality. With the assistance of our professionals, we have gained much appreciation from our clients and have carved a niche in such competitive markets.